Saw this news breaking on various sites today, so as a PSA I’ll relay it here: Adobe Digital Editions 4 has got significant privacy problems, to the tune of transmitting data to Adobe servers about books on your library in plain text. Some evidence points to this even including stuff not only in your ADE library, but elsewhere on the hard drive as well, such as in Download folders and Calibre’s standard library location. If you use ADE at all, you should doublecheck that you’re not running ADE 4. If you have an earlier version, do not upgrade. The various links are all reporting that the earlier ADE versions, while they do still transmit a small amount of data to Adobe servers, are not doing it to the scale ADE 4 is. I do use ADE, but only sparingly, and mostly as a means of checking out books from the library. This has mostly been trumped by me going directly to Overdrive apps on my various devices, though, and right now I’m really not seeing any reason to change that practice. 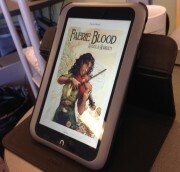 I recommend anybody with an interest in checking out ebooks from libraries should do the same if at all possible.